When you bring a new puppy home you’ll want to have it around you as much as possible. It’s natural to want to spend tons of playtime with your new dog. But proper housetraining is important and should start right away. One of the easiest ways to start training your dog is by using a crate or other means to keep the pup in a small area to discourage him from relieving himself anytime he feels like it. Use a dog harness or dog collar to take him outside often, but use the crate when you’re in doubt. This means that your dog should be restrained anytime he’s not being diligently watched. A small crate or box is ideal for this, since a larger area would simply allow the dog to relieve himself on an edge or in a corner and move far away from the mess. Smaller is better since dogs have a natural instinct not to mess where they have to sit and sleep. It might seem discouraging that the puppy has to be restrained this way at first, but you’ll be glad you did it once the dog housebreaks and you no longer have to worry about him going potty on the rug. 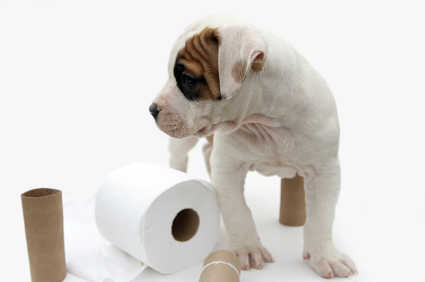 Take your dog outside frequently to give him the opportunity to potty. In the beginning, it’s good to do this whether the dog appears to have to go or not. Generally, the dog will take advantage of the opportunity and potty while outside. This will let you enjoy some playtime with the puppy outside its crate when you go back inside. If you wait too long between outdoor sessions, it’s more likely that the dog will relieve itself indoors. When the dog is out of the crate, watch carefully for signs like circling, sniffing or an attempt to get away from you. These could mean that the dog needs to potty. If you see these signs, quickly take the dog outdoors. Even if you have a large fenced-in yard and can simply open the door for the puppy to go outside unsupervised, go out with the dog for the first few weeks, at least. This allows you to make sure the dog goes potty while he’s outside. It’s also an opportunity to put a dog harness on your pup and walk him with a leash. Every opportunity to get your pet used to dog leash training is a good one, so walk him around the yard with the harness and leash while he’s finding a spot to potty. All your dog needs is a little guidance and you should be pleased with the progress. And don’t worry if your dog takes a little longer than you expect. Children don’t all get rid of diapers at the same age, and dogs don’t potty train exactly alike either. Be patient and consistent, and your dog will learn to go outside.